Embraced both by the Ionian and Adriatic Seas, Salento is Puglia’s southermost strip of land; a place of vast allure and history. Salento is not only the beautiful cities of Lecce, Otranto, Gallipoli and Santa Maria di Leuca, it is also a trove of hidden, mysterious surprises that characterise all of Puglia. 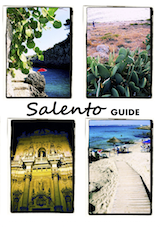 The best tourist itinerary is one that is custom-tailored to your desires and interests to provide you with an authentic experience in the hearth of Salento.